I’ve started to really enjoy branching out in my photography into areas I never thought I would go. One of those areas is outdoor sports, like fly fishing. We’re starting to get back into the season where the rivers aren’t quite so high or muddy from the Spring runoff. The insects hatches are starting to come out which means the great dry fly fishing will be upon us. This past Saturday was a an absolutely gorgeous day and my buddy Alex “twisted” my arm into going out for the evening on the Gallatin. Fishing with him is never easy because he always out fishes me. It’s annoys the fisherman instinct in me but it works out great for the photography. The one thing that we do that not every fishermen does is we hike quite a ways in from the launch point. This puts us in a better spot above or below where everyone else might have been that day. In this particular case it worked out great except we had to hike back after dark. 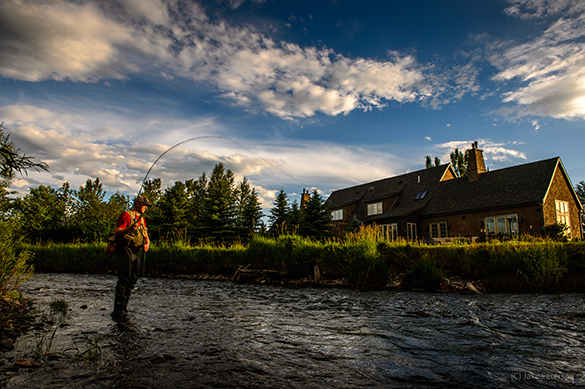 Fishing is always about combining man and nature and in Montana there is entire genre just on Mountain living. In that comes of course the housing and structures of the Rockies. 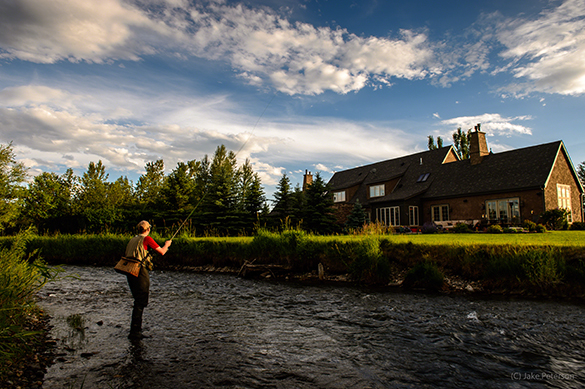 Well as we snaked and traversed the river we happened upon this lovely mountain home and it jsut happened to be the perfect back drop for that evening. Shooting with D4 and 24-70 AF-S f/2.8, my go to combo while fishing, and a little post processing in Adobe Camera Raw, a couple of clicks later provided that perfect afternoon mountain scene.